While I was admittedly quite jealous of my husbands trip to South Africa this summer to see the World Cup, he definitely made up for it with some of the thoughtful gifts he brought back for me. 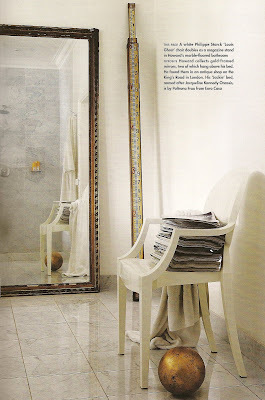 One of my special requests of course, was a copy of some of my favourite SA reads - notably Elle Decoration South Africa. I'm always blown away by the fantastic innovation and creativity that South Africa has to offer, and Elle Decoration always does a fantastic job of cataloguing some of its best finds. The June/July issue was just jam packed with beautiful photography and stunning spaces. I wish I could share the entire thing right here with you, but since that's not possible, I thought I'd share one of my favourite spaces. 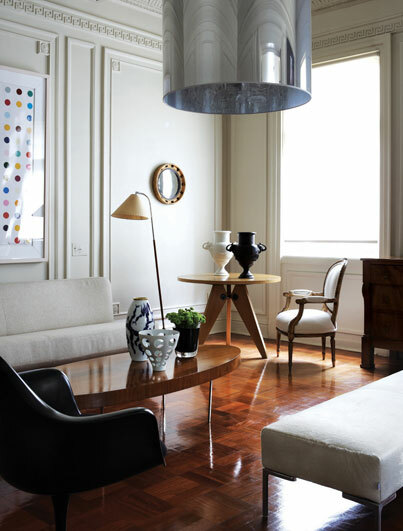 The home of Johannesburg couturier Howard Green is a beautiful homage to his favourite city - Paris, and of his favourite designers Christian Liaigre. This Moooi bookcase displays the covers of some of his favourite design books. Howard has accumulated an impressive collection of Fornasetti pieces, including this lamp (above) and several plates displayed throughout the apartment. The neutral space is brightened with spot of vibrant colour in pieces such as this artwork by Damien Hirst. The strong masculine style of Liaigre is evident throughout the space with its dark wood minimalism and calm palette of browns and creams, anchored with bold black pieces. The apartment itself has an elegant history, built in the 1920s, it was constructed for Isidore William Schlesinger, an American entrepreneur credited with bringing Art Deco to South Africa. "Decorating and dress-making go hand in hand - I'm not even sure which of the two is my first love," says Howard, "I have a very particular taste in objects, so I've built this look, one thing at a time, over 20 years." Howard's magazine collection (pictured above, right) is an impressive feature in itself, reaching from floor to ceiling. Of course, just as in Paris, there are several touches of glamour and gold throughout the space. Making it seem opulent and luxurious in its simplicity. 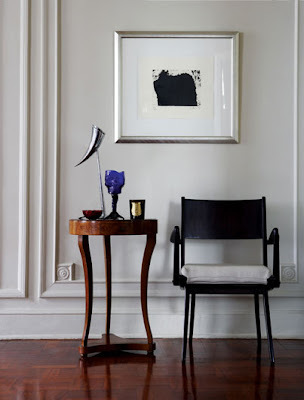 Oh I think that would look beautiful in your space - you also have so many gorgeous architectural details. Can't wait to see it when you get it! WOW!! What a gorgeous place to live! This is a really beautiful space. Very architectural! this is gorgeous. 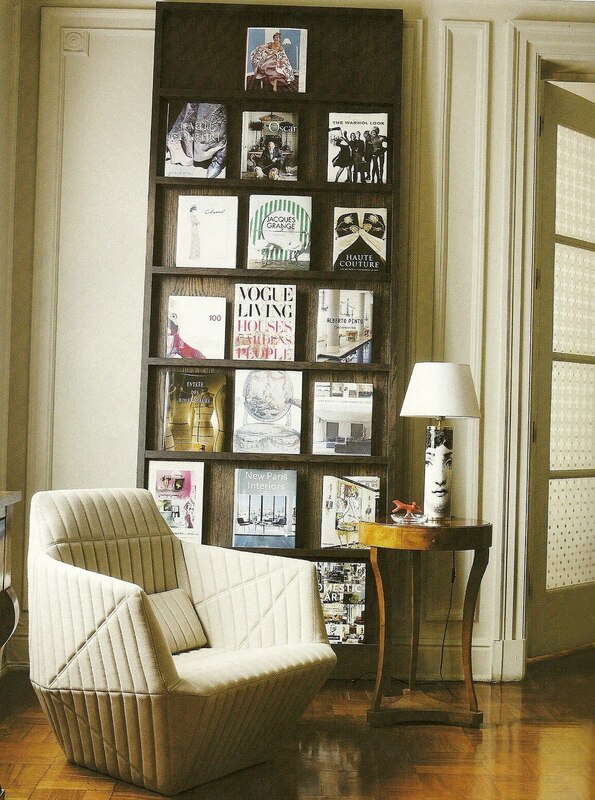 that bookshelf is so lovely. I recently borrowed this mag from a beautiful little lady... I instantly fell in love with this apartment. I also very much appreciate that the magazines are on display like art. I have a lot of magazines and while some people may scoff at my collection... I am always more than happy to lose a few hours to my old favorites. I love the subtle glamour of this place! THANK YOU! 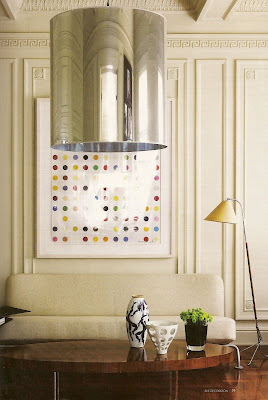 I have always loved the work of Damien Hirst, but I didn't know the name until now! I think I have every mag clipping of his work in the background of inspiration pages. Everything else is lovely too! Style Attic - oh so happy to have helped! + yes, Damien's work is so simple yet impactful. 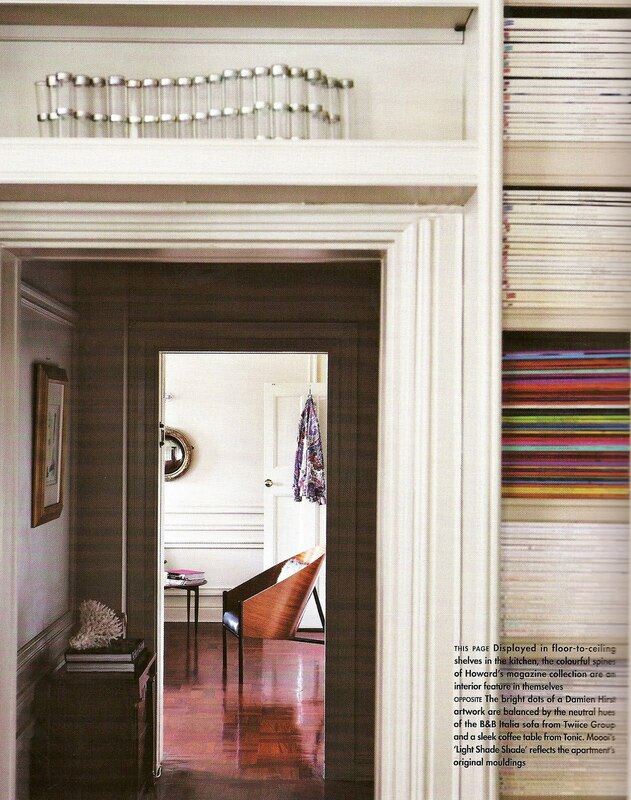 Kimia - the bookshelf was one of my favourite things also. Fashionable Palette - the architectural details really set the perfect stage for the whole home. It could almost be empty and still be gorgeous! 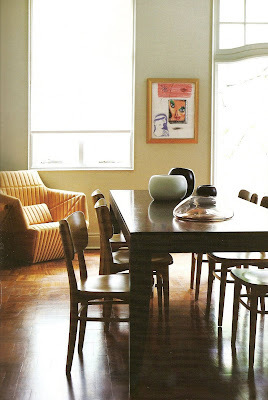 love this beige armchair! amazing!